Was on the road shortly after 8AM and I headed North on I25 into Wyoming. 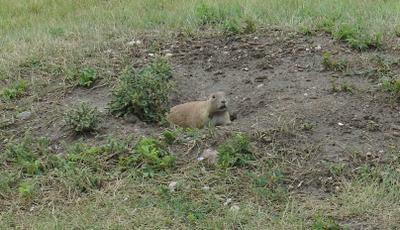 By early afternoon I was on hwy 18 which would take me into South Dakota. I didn't think of it beforehand, but I noticed on the map I would be driving through Wind Cave National Park on the way to Mount Rushmore, and since I still had plenty of daylight left, I decided I'd see what the park was like before continuing further north. From what I understand, Wind Cave is similar to places like Mammoth or Carlsbad - a large network of caves underground. 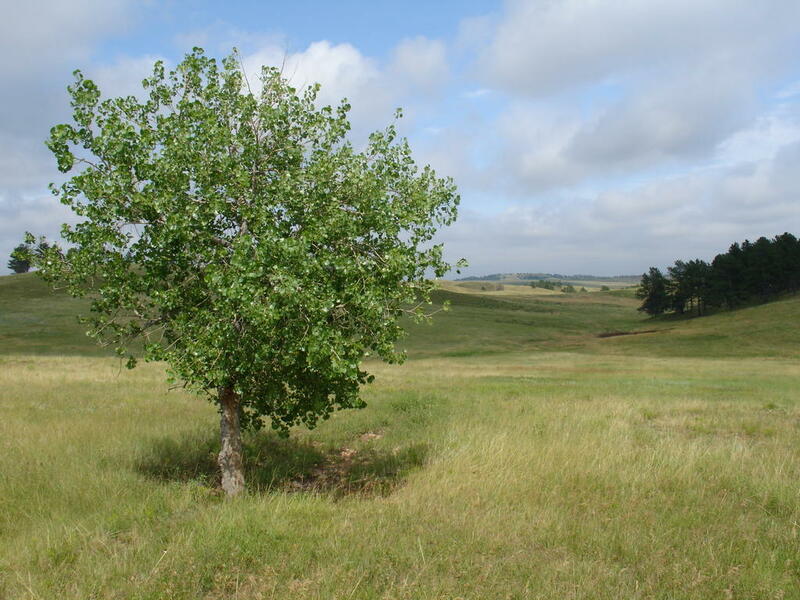 However, it is also made up of several miles of prairie and forest where bison, prarie dogs, and elk roam. It was originally set up as a preserve for bison and elk in the early 1900's as hunting by white settlers brought these animals to the verge of extinction. Not being much of a spelunker, I decided I'd stay above ground, maybe do a little walking, and see what animals were around. I didn't get to see any bison at any of the other parks I've visitied, so I was treated to a nice view of a herd of them shortly after I entered the park...they were right on top of a hill next to the road. One of them almost bumped into my car as it wanted to cross the road. 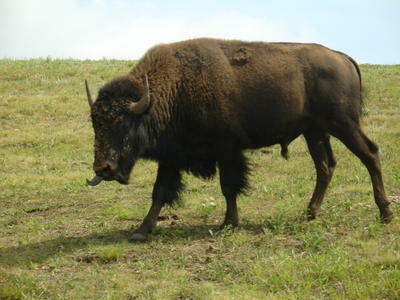 As you can see, bison are pretty big and visitors are told to keep their distance as they can be dangerous. On a side note, these aren't buffalo. I learned at the visitor's center that these animals were incorrectly named buffalo by European settlers after the animals from Asia, which are an entirely different species. I continued on the roads through the park, stopping to enjoy the nice scenery. It was odd...this place didn't have mountains, any big canyons, or huge rivers flowing through it, but I found it to be one the best places I've visited this whole trip. Maybe it was the simplicity of the place that I enjoyed so much...I don't know. I would have been able to just sit on the grass for hours, enjoying the nice breeze sweeping over the prarie. I also had the fortune of getting to see prairie dogs which I have never seen before. They are really little guys who make these high pitched barking noises to communicate, and they scurry back in their holes whenever someone approaches. I spent some time walking part of the Centennial Trail which goes on for several miles. It was probably one of the more enjoyable trails I've hiked on, as it cuts through hills and meadows; whereas, most of the trails I've been on have been in forests, which I don't enjoy that much. I headed back when I saw storm clouds approaching...fortunately, I only got rained on a little bit until I made it back to my car. 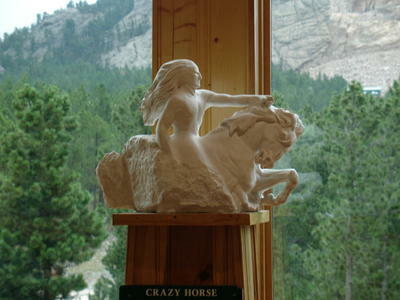 I headed further North and left Wind Cave National Park and headed towards the Crazy Horse Monument. I had only heard a little bit about this before and I wasn't quite sure what it was, and I was worried I wasted $10 gaining entrance to this place. But I couldn't be more glad that I spent that money. Just a little background info...Crazy Horse was one of the main strategists who led the Lakota to victory at the Battle of Little Big Horn (Custer's Last Stand). 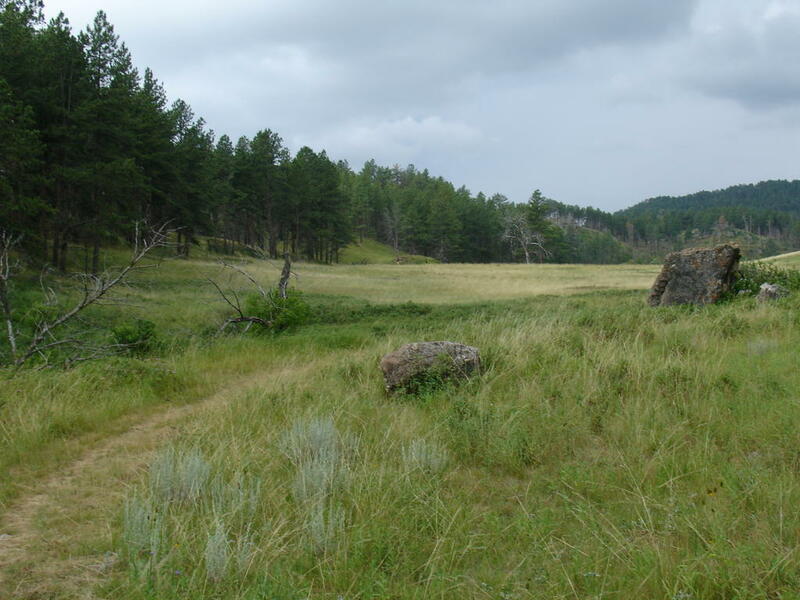 In the 1940's, the Lakota decided they wanted to honor him with a memorial in the Black Hills, considered sacred by the Lakota - in the words of Chief Standing Bear, they wanted to show white people that "red men had heroes, too." Picture this sculpted into the side of a huge granite mountain. As you can imagine, it would take a long time...right now, the only fully complete part is the face. When completed (no one knows when...it is all privately funded), the Crazy Horse memorial will be the biggest sculpture in the world, taller than the Washington Monument and bigger than the largest pyramids in Egypt. Korczak died, but the work is continued on by his large family. At the site is also the North American Indian Museum - it was enjoyable walking through there admiring the art and reading the stories of Native American heroes. I had to keep moving as I wanted to see Mount Rushmore before dark, but I hope to return some day and spend more time. The $10 was definitely well spent, and I got more than my money's worth. I believe the process being undertaken here is incredibly important and I hope it is completed within my lifetime. It was cold in the Black Hills...it had to be in the low 40's, and the cold wind didn't help. Fog was rolling in, and rain began to come down, so I debated heading towards Rushmore. It was only 10 miles from the main route I was on, so I decided I'd check it out. But by the time I arrived at the entrance, it was so cloudy and foggy I doubted I would be able to see anything of interest. I left and headed further North to Rapid City. I got a hotel room to spoil myself for the last time on this trip...I'll be home in a few days, and I'll have a place to stay in Indiana, and, most importantly, I've been under-budget on this trip, so I figured one last hotel stay would be fun. 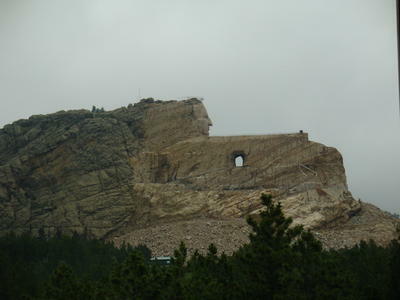 I woke up to rain and clouds, so I don't think I'll head back South to see Mount Rushmore. 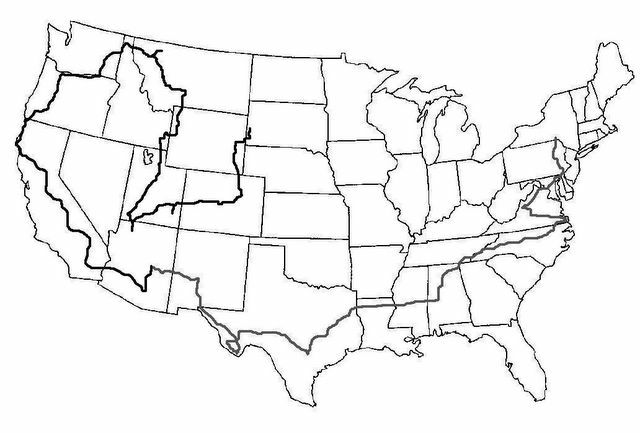 I'll head East across the state of South Dakota and then eventually SE into Iowa. South Dakota is an incredible state, and I've only been near the Western border.